Arizona's Politics is tracking the campaign finance reports being filed by candidates for statewide office in Arizona. The deadline for the 13-month period ended December 31, 2013 was Friday (Jan. 31). In addition to more in-depth articles (w/ links either to the article or to the report, in the right-most column of the table), here is a table summarizing the key numbers. We will keep this updated as the new reports come in - depending on work and family commitments, of course. Arizona candidates for Congress also are filing their year-end reports with the Federal Election Commission. Arizona's Politics has prepared a separate chart for those. Rep. Kyrsten Sinema (D-CD9) has topped $1,000,000 in her campaign bank account, ready for a stiff Republican challenge in November. The other announced Republican challengers have the rest of today to get their reports filed (although they might be filed and not yet up on the FEC's website). Wendy Rogers - who had $271,628 in the bank on September 30 - filed an amended 3rd quarter report last night, but has not yet posted the year-end report. Andrew Walter had a $150,00 war chest on September 30. And, the 2012 GOP nominee, Vernon Parker, had $80,449 cash on hand going into October. Although Sinema has not yet been targeted with the advertising barrage by Republican-philic groups that her fellow Arizona Democrats in swing districts are experiencing, the first-term Representative and Democrats are preparing for another free-spending battle in the Phoenix-area district. Rodd McLeod, a Sinema campaign spokesman, attributes the fundraising numbers to her focus on grassroots here in Arizona, telling Arizona's Politics "Kyrsten has worked hard during her first year in Congress to stay in close touch with the grassroots in Arizona, holding public meetings with constituents and supporters every month. One result of her Arizona-focused approach has been strong fundraising." He then took a swipe at the GOP candidates, referencing tax cuts for the wealthy and privatizing Social Security. Arizona Speaker of the House Andy Tobin is off to a rousing start raising funds for his Congressional campaign, tapping into a lot of the same lobbyists and PACs that contributed to his state legislative campaign earlier in the year (2013). Tobin is involved in a 4-way Republican primary battle for Congressional District 1, currently represented by Democrat Ann Kirkpatrick. Tobin gathered in $232,520 in contributions and had more than $191,000 of it in the bank on December 31, 2013. Arizona's Politics has conducted an extensive comparison of Tobin's final state legislative campaign finance report - filed with the Arizona Secretary of State's office on October 31, 2013 - with his first Congressional campaign finance report (posted at the bottom of this article). The number of lobbyists who contributed to both his legislative campaign in January 2013 (just before the legislative session began) and to his Congressional campaign in the last three months of 2013 is impressive. One of Tobin's other large source of contributions was Blue Cross/Blue Shield of Arizona. With many contributions from executives, employees and BC/BS-related PACs, Tobin received more than $10,000 from the health insurer. Tobin lists BC/BS as a primary source of his income on his most recent financial disclosure statement. Further review of the report indicates that slightly more than $11,000 of the contributions came from small givers. That would be under 5% of the total contributions. Arizona's Politics is tracking the campaign finance reports being filed by Arizona's Congressional candidates (and Arizona-based PACs). The deadline for 4th Quarer 2013 (or, "Year-End) reports is January 31. In addition to the more in-depth articles (w/ links in the right-most column of the table), here is a table summarizing the key numbers. We will keep this updated as the new reports come in - depending on work and family commitments, of course. Here's a link to our article about all of the candidates who have filed, along with links to their websites and other FEC filings. Candidates for state offices also are filing their year-end reports with the Arizona Secretary of State's office. Arizona's Politics will prepare a separate chart for those. All 4 of Arizona's Republican Representatives and the two "safe" Democrats voted against the $956 Billion Farm Bill package today, though it passed by a vote of 251-166. The three Democrats in swing districts voted "aye", with Rep. Ann Kirkpatrick (D-CD1) calling it "a good day for rural Arizona". A solid majority of the House's GOP members voted in favor of it (162-63) - Arizona's four Republican Congressmen (Franks, Gosar, Salmon, Schweikert) bucked that trend. Congressional Democrats were more mixed, with 89 joining with the GOP majority to pass the bill, and 103 saying no. Reps. Grijalva and Pastor voted "nay", while Reps. Barber, Kirkpatrick and Sinema said yes. According to The Hill, Republican no votes were upset with the overall cost and how the Republican leadership rushed it through; none of Arizona's GOP Reps have Tweeted about the bill this morning. The Hill's article also says that Democratic ire focused on the cuts to food stamps; $8 Billion was cut, more than the Senate version of the bill and less than the original House proposal. She was particularly pleased that the bill reauthorized and funded PILT (payments in lieu of taxes) obligations. PILT payments are from the federal government to local governments in areas where much of the land is owned by the federal government - and is thus, not available for the property tax base; only three other states receive more in PILT payments than Arizona. Kirkpatrick had introduced a plan to make PILT reauthorization permanent. Her spokesperson Jennifer Johnson tells Arizona's Politics that the Congresswoman "will continue to push her legislation to make PILT reauthorization permanent and give rural counties more stability and less financial uncertainty as they budget and plan." Citizens for a Better Arizona - the coalition that unsuccessfully attempted to recall Maricopa County Sheriff Joe Arpaio in 2013 - is holding a "caucus" tomorrow outside MCSO headquarters tomorrow to urge the Sheriff to "Stay Put." "My, how things have changed," is Arpaio's response to the announcement of tomorrow's demonstration. Last week, Arpaio announced that his 2016 re-election campaign had raised $3.5 Million during the 13-month period ending December 31. Campaign manager Chad Willems told Arizona's Politics that approximately $2M of that total was raised during the recall effort (which had apparently collected somewhere between 200,000 and the 335,000 valid signatures they needed to force a recall election). In the news release, Arpaio was quoted as noting that supporters urge him to run for Governor, and saying that he would (again) "give it serious consideration". Arpaio publicized it on his Twitter feed this afternoon, enjoying the turnabout: "Protestors who once called for my recall are coming tomorrow to new my HQ at 11am to ask me to stay Sheriff! My, how things have changed!" Raising $2M off of the recall effort that also cost CBA supporters a large sum of money has a way of allowing Arpaio to laugh about a demonstration trying to focus attention on the fact that "Maricopa County finally got a monitor to babysit (him)." Jeopardy-style: Arizona Rep. Trent Franks, Sens. Mitch McConnell and James Inhofe, and Liz Cheney. Alex, who are the only four candidates* to whom former U.S. Secretary of Defense Donald Rumsfeld has contributed to - and, maxed out to - in this election style? Rep. Trent Franks (R-CD8) has no Republican or Democratic challengers in his campaign for a 7th term in Congress, and has not been doing very much fundraising. From the limited number of contributors on his 4th quarter campaign finance report, one name jumps out - that of the well-known former Defense Secretary. Rumsfeld had not contributed to the West Valley Congressman since 2008, but on December 4, 2013, he made a maximum $5,200 contribution (1/2 for the primary campaign, 1/2 for the general election campaign). Franks raised most (57%)of his $49,415 in 4th quarter contributions from PAC's (political action committees), and now has $34,345 in the campaign bank acount. This is extremely low compared to other incumbent Representatives, but Franks has no announced challengers for either the primary or general elections. * The known knowns, reported thus far. Mr. Rumsfeld might have made other, similar contributions in 4Q2013 that have not yet been reported or do not show up in the CRP database. The contributions to McConnell and Cheney were made in 3Q2013. Arizona Rep. Raul Grijalva (D-CD3) is ready to endorse a Hillary Clinton campaign for President in 2016, according to The Hill newspaper. In 2008, Grijalva was an early endorser of Barack Obama, over Clinton - in what turned out to be a months-long, contentious primary battle. In 2007, Grijalva had endorsed former Sen. John Edwards' presidential candidacy, but switched to Obama in late January 2008. At that time, he did not say anything negative about Clinton. Arizona State Senator Kimberly Yee (R-LD20) participated in a nationally-televised panel of young, women "rising stars" in the Republican party yesterday. She told the RNC (Republican National Committee) and the C-Span TV audience that the Republican party "needs to wrap our arms carefully, diligently, around comprehensive immigration reform." She did not echo the view that is being expressed by several GOP U.S. House members in recent days that they support a path to legalization but not citizenship, but she made a plea for the House "to please listen to the border states; hear us out." The theme of the panel was how the GOP needs to reach out to women and minorities. In that vein, Yee's opening statement was about how Asian Americans need to see more people like themselves in the party and on the convention floor (Yee was a delegate in 2008). She noted that Asian Americans should be in her party, and noted that they are "highly educated... higher wage earners, and for the most part they own their own businesses." Yee was asked about to talk about her effective use of pro-life messages to resonate with voters. She talked about how she had sponsored the struck-down Arizona 20-week ban bill that the U.S. Supreme Court declined to reconsider this month, and how the pro-life bills are the ones"that tug(s) at my heart strings." Clicking on the picture above will bring you to the entire panel discussion. The links below are to the four times that Sen. Yee had the microphone. #2 You effectively use pro-life bills for outreach; talk about that. #3 "WE NEED TO WRAP OUR ARMS CAREFULLY, DILIGENTLY AROUND COMPREHENSIVE IMMIGRATION REFORM." #4 No war on women, "because here we are"
A couple of couples were chiefly responsible for keeping the lights on for the entire Arizona Democratic Party in 2013, and the state party is carrying bills that normally should be paid on a monthly basis. Financial reports filed at both the state and federal levels paint a grim picture coming out of a non-election year. The federal account is more than $58,000 in the red - larger than either major Arizona party has experienced in recent years. It is a Chair's Club, so to speak, that provided more than half* (54%) of the party's operating cash receipts during the last month of 2012 and all of 2013 - $292,500 out of $542,353, as reported to the Arizona Secretary of State's office. Current Chairperson Bill Roe and his wife Alice bankroll $155,000 of the parties expenditures, and past chair Jim Pederson and his wife spent another $137,500 to pay the bills. The party starts 2014 with a balance of just over $19,000 in that operating account. The 2013 contributions by the couples actually represent a slow year for the Roes and Pedersons - even when you include their other political donations. (The Roes and the Pedersons also made about $75,000 - each - in other federal contributions, according to a search at the Center for Responsive Politics - OpenSecrets.org.). Pederson - a successful commercial real estate developer in Phoenix - has spent large amounts of their own money on Democratic causes (including his unsuccessful campaign for the U.S. Senate), and the Roes (Bill is a successful attorney) spent approximately half-a-million dollars on Democratic candidates and causes in 2012. A couple of quick comparisons are in order to put this in perspective. First, the Arizona Democrats' comparable FEC report in 2011 showed cash on hand of only $8,319 but NO DEBTS; it was in the black. Second, the Arizona Republican Party - which has had their own lean times, as documented previously by Arizona's Politics and others - filed their FEC report for the period ended November 30, 2013, and showed a robust cash on hand of $144, 303 (with no debts). The Arizona Democrats will be holding their State Committee meeting this Saturday, at Mountain Pointe High School, in Phoenix. It is likely that the finances will be mentioned. Or, not. It is probably more likely that the Democrats' financial picture will be discussed at the REPUBLICANS' State Committee meeting, held concurrently a few miles away in Tempe. * Clarifications, reaction, 1:30pm: Arizona's Politics has received an absolute denial from the Arizona Democratic Party that it has ever skipped any credit card payments. D.J. Quinlan, Executive Director of the ADP, assures Arizona's Politics that no payments were missed; he is going to review page 81 of the December FEC report, where it appears. Quinlan also assures readers that - due to the complexities of reporting for state parties - one must analyze the FEC reports and the state reports together to get a more complete view of operating finances. For example, the total revenues of the ADP are closer to being a combination of the both FEC reports and state reports. (In addition to this, you have to match up the different time periods covered by the reports.) Doing this, you come to the conclusion that the Roes and Pedersons together provided approximately 22% of the ADP's total revenues for 2013. Arizona's Politics recognizes these complexities, and attempts to accurately distinguish between the FEC reports and the state reports. Regarding the deficit, Quinlan notes that off-election years are typically lean but that the party decided to continue to run a robust party operation to better position them for the upcoming elections. Arizona Rep. David Schweikert (R-CD6) will assume the chairmanship of the U.S. House of Representatives' Subcommittee on Environment. Schweikert says he is "honored" and sees it as an opportunity to rein in the Obama Administration's propensity to "impose its will on the American people through regulatory fiat." Though the news release from the Science, Space and Technology Committee does focus on the oversight function, the statement from Chair Lamar Smith (R-TX) does note that the Environmental Protection Agency ("EPA") should "utilize the best available science.” Neither Smith nor Schweikert mentioned protecting the environment as a present concern of the committee. Schweikert's office notes that the Subcommittee also has jurisdiction over "the National Oceanic and Atmospheric Administration (NOAA) and National Aeronautics and Space Administration (NASA)." Maricopa County Sheriff Joe Arpaio raised more than $3.5 Million during and after last year's failed recall effort, according to a press release from his 2016 re-election campaign manager. Arpaio sees it as an indication that he should give "serious consideration" to entering the already-crowded Republican race for Arizona Governor this year. The campaign finance report for the 13-month period from November 27, 2012 through December 31, 2013 is not due until the end of this month, and has not yet been posted on the County's website. But, Arpaio campaign manager Chad Willems released the numbers today, saying that he "continue(s) to be blown away" by the support. Arizona's Politics has asked Willems for a breakdown of how much of the support came in response to the failed recall effort last Spring. The recall effort was the subject of many fundraising e-mails from the Sheriff and his wife. The ongoing legal battles regarding the MCSO being found by a federal judge to have engaged in racially-biased policing has also been a fundraising "hook". Arpaio and the MCSO recently wrote a letter to U.S. Attorney General Eric Holder demanding that the federal government pay $38 Million for costs associated with the Melendres case and ensuring that the Sheriff's Office does not racially profile in the future. As Republicans look to defeat three Arizona Democrats in swing Congressional districts, the appetite to defeat longtime progressive Rep. Raul Grijalva (D-CD3) has waned. As a result, the campaign of Gabriela Saucedo Mercer - who was the Republican nominee in 2012 - is starving. Saucedo Mercer has filed her campaign finance report for the year ended December 31, 2013, and not only is it barely in the black, but it pales in comparison to where she was at this point two years ago (when she was a no-name new candidate). Saucedo Mercer, a Tucson businesswoman, brought in $5,795 in contributions in the 4th quarter of 2013, with a total for the year of $22,351. As of December 31, the campaign's bank account had a balance of just $773. In 2011, she had brought in more than $100,000 in contributions and started 2012 with $10,000 in the bank. She had benefited from contributions from several employees from Rosemont Copper and related companies, as well as reliable Republican donors. In 2013, only Jim Click and Gabriela Saucedo Mercer stand out among the major donors. Of course, much of her 2011 fundraising success can be attributed to the fact that it was just after Grijalva had barely passed the 50% mark in the 2010 election against Ruth McClung. And, the lack of success in 2013 may be because Grijalva defeated Saucedo Mercer 58%-37% and the Republican money is being saved for the neighboring races against Reps. Ron Barber (CD2) and Ann Kirkpatrick (CD1). Grijalva has not yet filed his year end report (due January 31), but he had $95,000 in the bank on September 30, 2013. Arizona's Politics attempted to reach Saucedo Mercer for comment on her finance numbers. Arizona and Kansas are still headed towards having separate ballots for people who register to vote with the federal form (and do not separately provide proof of citizenship). Last night - just before a court-ordered deadline - the Acting Executive Director of the ghost ship known as the U.S. Election Assistance Commission issued a scathing decision determining that the states showing that 0.007% and 0.001% (respectively) of registered voters are non-citizens - which may or may not have been prevented by requiring proof of citizenship documents - is not enough to justify changing the federal voter registration forms. The result of yesterday's decision - which is found below and which concisely-yet-completely summarizes the entire situation - is likely to be that Arizona and Kansas will continue to play out the legal effort to force the federal voter registration form to change, but will have to continue with their plans to print out federal office only ballots for people who use the federal form to register. For the last several weeks, Americans for Prosperity ("AFP") has had Arizona's airwaves to themselves, softening up embattled Democratic Reps. Ann Kirkpatrick (D-CD1) and Ron Barber (D-CD2) with ads hammering their support of Obamacare; this week, a pro-Democratic Super PAC, the House Majority PAC ("HM"), began hitting back, running ads to support the incumbents. Arizona Senators John McCain and Jeff Flake were among the 26 Republicans who voted against the $1.1 Trillion federal government spending plan that will now be signed by the President (after passage in the House). 17 Republicans joined the Democrats in passing the plan that had been worked out by negotiators from both parties. McCain and Flake both indicated in advance of the Thursday night vote that they would not support it, primarily because of some of the wasteful spending contained in it. HOBSON: Well, the other thing that some people may look at is these things that I know nobody's calling earmarks, but they certainly look a lot like earmarks. FLAKE: Yeah, fortunately over the past couple of years we have banned the practice of earmarking, ostensibly. There are still things that look a lot like earmarking, like you say. The truth is that the, you know, in its heyday back in 2005, 2006, there was some 16,000 earmarks, about $40 billion worth spread across the appropriation bills. So the practice has been largely marginalized, at least, and that's a good thing. But a lot of the programs that grew up during the earmark era just continue in these agencies and have continued in the president's budget or directed by congressmen. HOBSON: Well, what do you call what's in this bill, if they're not earmarks? FLAKE: Well, directed funding I guess you would say. People in position on the appropriations committees are in a position to more easily make sure their programs of choice continue to get funding. But it has, like I said, it's been marginalized largely. There's far, far, far less of it that's happening now. And, you know, sometimes it takes the form of letter-marking or calling the agencies, asking them to continue funding. And, you know, the agencies know who butters their bread, too. And so they're not wanting to go against any direction from appropriators. McCain prepared statements to speak on the floor to express his several concerns with the plan: “With our country facing a rapidly growing $17.3 trillion dollar debt, which amounts to more than $54,000 per citizen, it is time for Congress to return to ‘regular order’ and consider each one of the 12 individual appropriations bills in turn to fund the activities of our government before the end of the fiscal year – with ample time for debate and amendment, instead of ramming through massive 1,582 page Omnibus appropriation bills like the one before us today. The American taxpayer expects more and deserves better than what we are giving them in this bill." The rest of his statement is below the jump. Arizona's Politics could not locate the video on C-Span's feed this morning, and suspects that he did not end up delivering them. However, at the beginning of the day, he did rip into the Senators who put the omnibus bill together for allowing "secret provision" that deals with shifting the drone program from the CIA to the Pentagon. An article on the front page of yesterday's Washington Post had called his attention to it. The primary fields for Arizona's three most competitive Congressional districts are likely filled, and there are 9 Republicans vying for the three Democratic incumbents. Three incumbents have no challengers at all, and a fourth has one independnt challenger. The most attention in the August 26 primaries will be focused in Districts 1 and 9. CD1 comprises much of northern and eastern rural Arizona and is currently represented by Ann Kirkpatrick. State lawmakers Adam Kwasman and Andy Tobin (House Speaker) have the most name recognition, but business owner Gary Kiehne got a fundraising headstart. Jim Brown filed earlier this month, and Mike Olivas previously filed, but his paperwork makes it appear that he is no longer officially a candidate. In Maricopa County's CD9, incumbent Kyrsten Sinema will wait to see whether newcomer/former ASU quarterback Andrew Walter can defeat two candidates who ran for the seat in 2012 - Vernon Parker (nominee) and Wendy Rogers. Southern Arizona Democrat Ron Barber (CD2) will wait to see whether Martha McSally can repeat as GOP nominee vs. Shelley Kais. Two Republicans who previously tried to defeat long-time Rep. Raul Grijalva in CD3 are giving it another shot, but no Republicans have stepped forward to challenge Ed Pastor in CD7. A Democratic activist is opposing GOP incumbent Paul Gosar (CD4), and an independent has filed against Matt Salmon (CD5), but Republican incumbents David Schweikert (CD6) and Trent Franks (CD8) have no challengers. Arizona Reps. Matt Salmon (R-CD5) and Ron Barber (D-CD2) joined a bipartisan pair of Senators today in urging Congressional leadership to make "bipartisan seating" a permanent tradition at the President's annual State of the Union address. Barber and Salmon joined Senators Mark Udall (D-NM) and Lisa Murkowski (R-AK) in sending a letter to leadership, and encouraging their colleagues to continue the recent symbolic tradition. Arizona's Congressional delegation was front and center at the State of the Union address three years ago when the idea first started to catch on; it was three weeks after the shocking assassination attempt on southern Arizona Rep. Gabrielle Giffords which took 6 lives and injured 12 others (including Barber), and the entire Arizona delegation sat together during President Obama's speech. Barber has continued the bipartisan tradition since succeeding Giffords, sitting last year with Salmon. Arizona Reps. Kyrsten Sinema (D-CD9) and Ron Barber (D-CD2) joined 31 other Democrats this morning in voting for a Republican bill to require the Obama Administration to provide weekly updates on the progress of Obamacare - rather than monthly. The vote for the Exchange Information Disclosure Act (H.R. 3362) was 259-154. It is extremely unlikely to be considered by the Senate. The White House opposed the bill because it would impose an unneeded burden on the people who are focusing on getting the kinks out of the bungled rollout of the health insurance marketplaces. Republicans counter that more frequent reports would help people predict possible premium increases. “The fundamentals of healthcare reform are good but the rollout of this law has not gone smoothly,” said Sinema. “This legislation improves oversight of the website and implementation of the healthcare law by providing additional information to Congress and the public. This information will demonstrate where healthcare reform is working and that Arizonans have access to affordable health insurance. It will also help us determine where implementation is falling short so that we can respond quickly and make it work for hardworking Arizonans. As the Senate is (sporadically*) debating the $1.1 Trillion spending plan to prevent another government shutdown this morning, Arizona Rep. Raul Grijalva (D-CD3) is explaining to Arizona's Politics why he was one of only three Democrats to vote against the omnibus measure in the House yesterday afternoon. The Tucson Representative believes that it "reaffirms bad policy we already know has done more harm than good. Austerity hasn’t worked, and this is austerity-lite at best." Grijalva joined Arizona's four Republican Representatives in standing against the measure, which was approved in the House by a vote of 359-67. It is expected to pass in the Senate and be signed by the President. Of course, Arizona's Republican Representatives voted "nay" for different reasons. Rep. Paul Gosar (R-CD4) listed several reasons he voted against the "massive spending bill". Primarily, he cited that it would increase spending and "balloon the national debt." * the debate is "sporadic" and is being interspersed with Arizona Senator John McCain and a couple of his colleagues discussing the recent Senate Intelligence Committee's report on the Benghazi embassy killings. UPDATE: Sen. Flake Tells Arizona's Politics Congressional Action Warranted IF "Iran Fail(s) To Live Up To Its Commitments"
Arizona Senator Jeff Flake (R-AZ) is not going to join the rest of his GOP colleagues - except for Sen. Rand Paul (R-KY) - and some of the Democrats in co-sponsoring an Iran sanctions bill unless that country "fail(s) to live up to its commitments." Earlier today, Arizona's Politics reported that Senators Flake and Paul were receiving criticism from fellow Republicans for their holdouts. "Over the coming weeks I will be monitoring the implementation of the interim agreement between the P5+1 and Iran. Should Iran fail to live up to its commitments, additional congressional action on sanctions will be warranted." Arizona's Politics confirmed that Sen. Flake made this comment today. Implementation of the interim pact reached late last year is scheduled to begin next week, and the next stage of talks are now slated for February 8. The U.S. House of Representatives may have just voted 359-67 to pass a bi-partisan $1.1 Trillion spending plan, but Arizona's Congressional delegation voted "nay" - in a bi-partisan fashion. The plan now goes to the Senate. Per Politico, lawmakers are scrambling to meet a Saturday deadline to prevent another government shutdown. Arizona Senator Jeff Flake is one of only two Republicans (Kentucky's Rand Paul being the other) who has declined to co-sponsor the Iran sanctions bill (S.1881). He is fielding criticism from members of his own party, but received defense from a commentary on the libertarian - and Koch Brothers-founded - Cato Institute website. Arizona's Politics has asked Flake's office for an explanation of the hold-out, and will update when the response is received. But, the Senator told Slate's David Weigel yesterday that he is "monitoring negotiations.... I want to see if this is a net plus, or not. I think it is, so far." The "Nuclear Weapon Free Act of 2013" currently has 58 co-sponsors, and is designed to keep pressure on Iran while six world powers - led by the U.S. - negotiate with Iran regarding that country's nuclear and/or nuclear weapons program. Many also believe that if Congress passes the new sanctions bill and overrides a presidential veto, that it will scuttle the negotiations. The Cato Institute - a libertarian think tank founded in the 1970's by the now-infamous billionaire Charles Koch - published a commentary this week blasting "neoconservative" Republicans promoting the sanctions bill and praising Flake and Paul. The commentary compares the present situation to when neocons opposed then-President Ronald Reagan's efforts in 1988 to negotiate treaties with the diminished Soviet Union. Arizona Senator Jeff Flake (R-AZ) participated in an in-depth questioning about the civil unrest in South Sudan. The Senate Foreign Relations Committee spoke with witnesses from the State Department and the U.S. Agency for International Development last week. The questioning was informative and not partisan as the Senator explored with the witnesses various angles of the complex conflict, and how the U.S. could and should proceed. The first panel was made up of an Ambassador from the State Department and an administrator from the U.S. Agency for International Development. The second panel was more expressive, as it featured the co-founder of an NGO, a National Defense University Professor, and a State Department negotiator. If you are interested in watching more of the 2:14 hearing, you can click here. 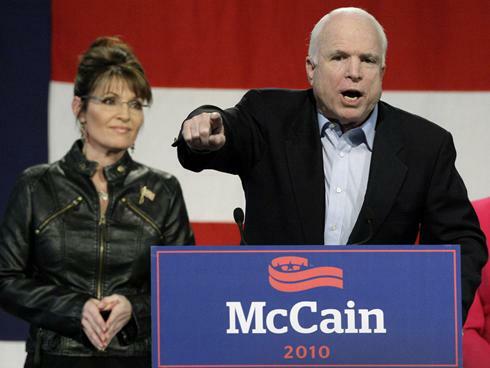 While John McCain has officially wavered about whether he will seek a 6th term as U.S. Senator from Arizona in 2016, his campaign has sent out invitations for a $1,000/person Washington fundraiser saying that McCain "would be delighted to see you... for his first DC re-elect reception." The invitation, reproduced below courtesy of the non-profit Sunlight Foundation's Party Time, calls for supporters to converge upon Johnny's (no relation) Half Shell on Tuesday, January 28 at 5:30pm. Friends of John McCain held a fundraiser in New York in December - when he was up there for an appearance on a Sunday news show - however, the invitation noted he was only "consider(ing)" a new run. It is very possible that the Senator will concentrate more fundraising efforts than normal outside of Arizona, in light of this past weekend's overwhelming censure vote of McCain by precinct committeepeople making up the Maricopa County Republican Committee. 1) Only 3 Senators have a lower "average net worth" than our Arizona Senator Jeff Flake (R-AZ); and, only 15 Representatives have a lower ANW than Rep. Kyrsten Sinema (D-CD9). Both have been in public service for most of their adult lives (although Sinema is quite a few years younger than Flake). 2) Arizona Rep. Trent Franks' (R-CD8) ANW of more than $33Million Ranks 21st In House - the top 5%; Sen. John McCain's $7.4M ranks only 19th in what used to be known as the Millionaires' Club - top 20%. While both have been in public service for a long time, Franks' wealth comes from his oil and gas exploration company, and McCain's is largely based on Cindy McCain's family's beer distributorship. Six members of Arizona's Congressional delegation are hypothetical millionaires, according to thir personal financial disclosure statements for 2012, and Rep. Trent Franks (R-CD8) among the 30 wealthiest members of Congress, with an approximate net worth of $33 Million. Two Arizonans - Senator Jeff Flake (R) and Rep. Kyrsten Sinema (D-CD9) - could actually have a negative net worth, with the latter listing no assets to offset her outstanding student loans. Using the wide-ranging categories and rules, and methods for arriving at an "average"/median, Franks actually saw his net worth drop slightly between the end of 2011 and 2012. Some of that is due to the fact that he reported two charge accounts of at least $15,000 each that had not previously been listed. His principal sources of wealth, interests in privately held petroleum trusts, have remained valued at the same $11-55 Million for the last several years. (1) To figure out the "average net worth", CRP calculated the range of the assets, and then reduced the low end of the asset range by the high end of the liabilities range, and vice-versa. This provided the lowest possible net worth and the highest possible net worth. They then calculated the midpoint of this range and called it the "average net worth." For example, Sen. Flake lists three assets. The lowest possible value of these assets is $301,003 and the highest possible value is $615,000. His only liability is between $250,001 and $500,000. Therefore, his lowest possible net worth is negative $198,997 and his highest is $364,999. The "average net worth" assigned to Sen. Flake is therefore $83,001. Note: Both Senate and House disclosure rules now exclude any residential properties not rented out, and mortgages on those properties. Other rules might also skew the actual financial net worth of these public officials.